Internet measurements is a well known research area in networking, but it is still at an early stage in many developing regions including Africa. Typically, Internet measurements provide information with regard to coverage of networks (e.g. WiFi and cellular networks), performance (e.g. Internet throughput and latency) and usage. Importantly, Internet development campaigners, as well as policy makers in the developing regions, have recognised the crucial role that Internet measurement data can play in facilitating evidence-based policy-making and advocacy. Such information is helpful in guiding policy formulation, as well as for policy makers and regulators to monitor the effect of regulatory and policy interventions and market developments. Appropriate acquisition of such Internet data requires a variety of research methods, including wide distribution of Internet probes for technical measurements, located in diverse locations and networks, as well as region-specific techniques and technologies; demand-side surveys on internet access and use; and price benchmarking. The development and deployment of Internet measurement infrastructure and methods requires cooperation among different Internet players. 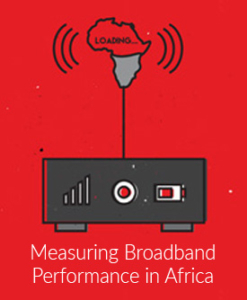 However, until recently, there has been little such coordination among Africa’s Internet measurement researchers and few interactions with the broader international Internet measurements research community. Consequently, development of Internet measurement research in Africa has remained one of the lowest globally. That said, the opportunities for collaboration are plentiful, including collaborative development of measurement infrastructure between the research community and service providers, as well as the sharing of research methods, analysis tools and data. This workshop is intended to build and foster an African community around Internet measurements research, with the opportunity for collaboration with the global research community.